Throughout my life, I have been repulsed by simple designs of small roses found on flannel sheets, wall paper, etc. Whenever I saw it, my body would tremble and tears would well in my eyes. For most of my life, I never knew why that was or how to stop the reaction. When my father died, I was tasked with cleaning his house. For the most part, I treated this job mechanically. Since growing up was not easy for me, it was easy to trash 35+ years into a dumpster. But then I came upon a laundry bin full of soft fabrics that my mother used for cleaning. In the bin I found the evidence of my years of torment when I saw the fabric with small roses. There stood the remnants of soft flannel pajamas that I wore as a toddler; I remember never wanting to take them off of me. I loved my pajamas! The moment I saw the rose covered fabric, I started crying hysterically; I couldn’t breathe; my entire body trembled. All I could do was curl up into a ball and sob like I haven’t sobbed in years. The details don’t matter, but at that very moment, I remembered how those pajamas became rags. The vision was pretty gruesome and the pain that I have endured since is hard. In a millisecond this morning the old reality was transformed. I was blessed with a beautiful shift in that old reality. 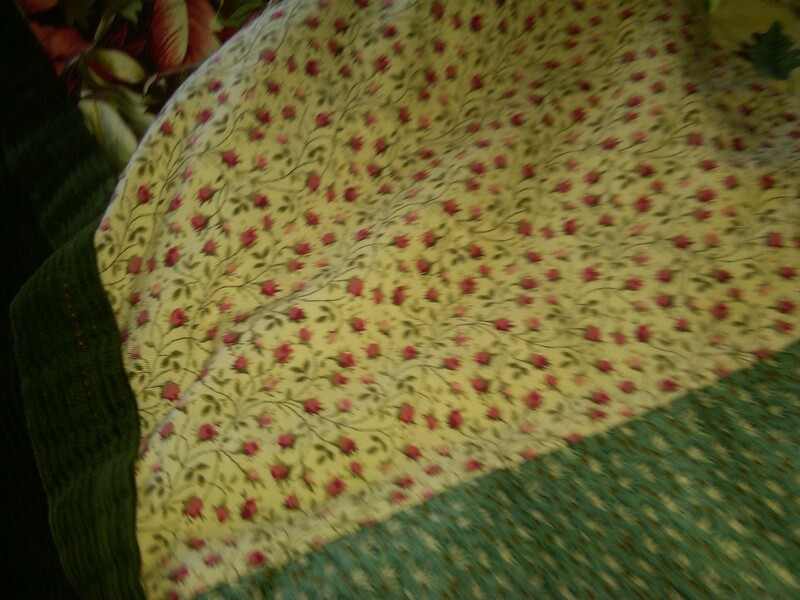 As I was curled up in bed under my favorite blanket, I saw a patch of that very same rose design on my quilt. My friend Carol made me this beautiful quilt; she chose every fabric and texture to honor not only my love of nature, but my need for both a heavy yet soft quilt. I love this quilt more than any object in my life. The love Carol gave to me when she created the quilt was enormous. At that time, no one had ever given me such a gift. (Note: Since that time, I have been given several gifts that were made with me in mind from friends that made me feel loved.) As I looked down at my precious blanket, the rose design on the square was transformed as a sign of love. With each step that I take, I heal. Being healthy is not an option for me. Health is a mindset and I need to be the healthiest person that I can be. Regardless of my starting point, my physical limitations, or my emotional being, I need to move forward from where I am at any given moment. Last year, I began my health journey (stage 1) 45 days before my 45th birthday. I guess now would be a good time to share that I was off in my counting and it was actually 46 days. 🙂 In stage 1 of my journey, I stopped eating sugar, caffeine, and soda. The process helped me to lose initially 63 or so lbs although I sometimes find myself struggling with an extra 3-5 lbs. The good news is that I don’t let that reality get me down, but I look forward to breaking that cycle as I move into the next phase of this journey. With each phase of my health journey, I have been aware that I need to make lifestyle changes so that becoming healthier is natural and sustainable over time. So far, I have done that with my eating and my spiritual journeys. Now it is time for me to do it in terms of movement/exercise. Today I is Day 1 of my 60 Day Health Journey. My goal is to continue from stage 1 and now add simple and daily movement. My routine will incorporate sit-ups, push-ups, light weights, leg lifts, yoga poses, etc. I am thinking about getting an exercise ball, but I haven’t made a decision yet. I will also continue walking and biking; although the cold weather might not make for frequent biking. My long term goal is to one day jog again; I’d really love to do a half-marathon, but I think it might end up being a 5 K or possibly a 10 K instead. In truth, what matters is that I can become the healthiest me that I can. Today is only the beginning, but isn’t each day a new beginning open to new possibilities. Thanks for joining me as I take on the next stage of my Health Journey. All simple ideas are welcome! !